Much to my surprise and delight my wife, aka "The Timid Traveler," loved Venice it as much as I did. Surely the outstanding treatment we received at our hotel, The Al Ponte Antico, played a major role. We arrived in Venice in the late afternoon and took a vaporetto to the stop nearest our hotel, then walked about two blocks through the narrow, winding streets to the Al Ponte Antico. The Al Ponte Antico is a small, nine-room hotel in what owner Matteo Peruch calls an “old palace” with a remarkable view of the Grand Canal and the Ponte Rialto (Rialto Bridge). "Al Ponte Antico" means "The Old Bridge," and is a reference to the Ponte Rialto. While our guest room (No. 6) was smaller than we would have preferred (it IS Venice, after all) it was well-appointed and decorated in the Italian style you’ll see when you visit The Doges Palace on the Piazza San Marco. Everything else about our stay was absolutely perfect. Matteo greeted us when we checked in, showed us to our room personally, and had a chilled bottle of prosecco waiting in the room as a “welcome gift.” Virtually every member of his staff greeted us by name each time they saw us, making us feel more like we were staying in someone’s elegant home rather than in a hotel. Breakfast is included, with a generous buffet of meats, cheeses, and fruit. Eggs and breakfast meats are also offered, and Matteo mans the omelet station for those who prefer. You can dine indoors or on the patio overlooking the Grand Canal if the weather is cooperating. As there are only nine rooms and breakfast is available over several hours, we had the dining area/lobby to ourselves most mornings. In the late afternoon and into the evening, Matteo and his staff serve drinks and snacks along with cordial conversation and advice on where to dine. 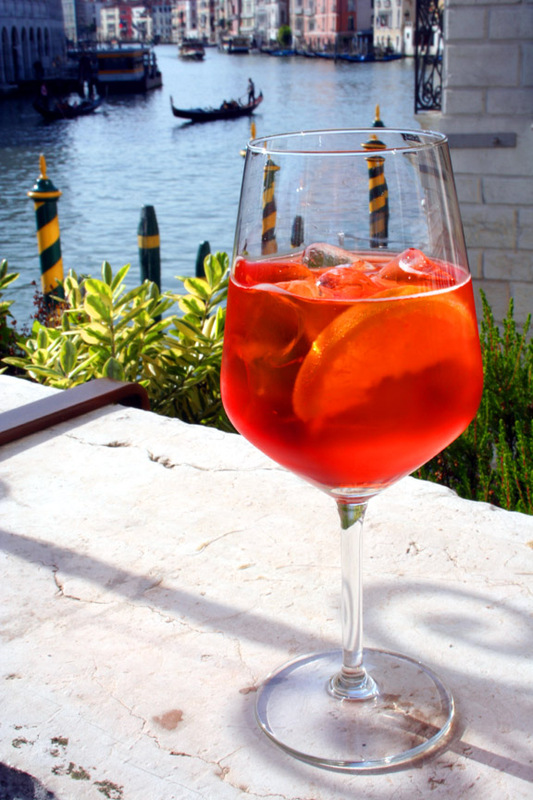 Try a traditional Italian Spritz, shown at left. This social time is a great opportunity to get to know your fellow guests and perhaps forge new friendships. The Al Ponte Antico is close to the farmer's market (just the other side of the Ponte Rialto) and a number of osterias and tratorias. On our first night, not wanting to venture too far from the hotel, we walked across the Ponte Rialto and found the Osteria al Pesador, which was directly across the Grand Canal from our hotel. We sat on the piazza and enjoyed a delightful dinner of warm octopus salad (with tomatoes, celery and spices), followed by cuttlefish with squid ink (no kidding!). We loved both and, when we related our experience to Matteo, his response was, "Now you're a little more Veneitan!" There are two things to note about the Al Ponte Antico. Because it is small (intimate, really) it's not the hotel to choose if you want to be anonymous. As noted above, staff learns their guests' names quickly and uses them often. Second, because it's right on the Grand Canal, it can get a bit noisy - particularly if you have a canal-side room. With those small caveats, I highly recommend availing yourself of the hospitality of Matteo and the rest of the staff at the Al Ponte Antico. Beautiful photos. I hope you enjoyed your travel in Venice. Looking forward the the subsequent post about your travel.